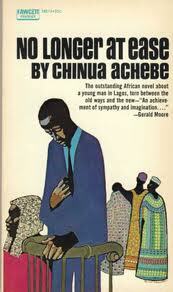 No Longer at Ease by Chinua Achebe is my third novel for my personal Iconic African Authors Challenge. Published in 1960, this was Chinua Achebe's second novel and tells the story of Obi Okonkwo, the grandson of Okonkwo from Things Fall Apart. It is 1950s Nigeria and Obi has just returned to Nigeria after 4 years in England studying English. This was made possible by the Umuofia Progressive Union (the villagers pooled their money to create a scholarship), which he has to pay back within four years of his return to Nigeria. The novel begins with Obi on trial for taking a bribe, and then we go back in time to find out how this honest man (who detests corruption), with a UK education, working for the civil service, with a very good salary, could take a bribe. Just as in Things Fall Apart I did find a number of themes. After spending four years in England, Obi now struggles with tradition, the expectations of his village, the UPU and his family to not forget his tradition, and a modern lifestyle in Lagos. Being educated abroad Obi was given a "European post", but this prestigious job comes with a lot of responsibilities. Obi has a lot of people to please, but at the same time, his new Western lifestyle comes with a costly price tag. Obi is faced with many dilemmas and unfortunately doesn't handle them very well. There's also the influence education has had on Obi. While it has enabled him to get a good job, it is also the one thing that makes him different in Nigeria. The major one to me was corruption. This was the story of an honest man trying to survive in a dishonest Nigeria. I asked myself, how do you resist corruption when it is all around you? Or actually how long does it take to become part of Nigeria's corruption? And what exactly leads an honest man, like Obi, to become involved in corruption? No Longer at Ease does give us an insight into the events that led to Obi being on trial for taking a bribe. Again I asked myself "Why did it take me so long to finally read it? ", and now I am really looking forward to reading Arrow of God. Hi Pam! Glad you enjoyed the review. It is an interesting question and one I'm always asking myself, especially in Nigeria where corruption is embedded into almost every aspect of society. And I can see it as well - giving up after a while. It's hard being honest when you're surrounded by corruption and it doesn't help when you're told that if you don't do it, someone else will. Arrow of God is my favorite Achebe so far, so I really look forward to your thoughts on it. This was an interesting book, as you say, for examining how hard it could be to resist the pressures. Yes, I'm really looking forward to reading it as well. I was late to the game, but I'm slowly becoming an Achebe fan. No longer at ease was my favourite in the trilogy. However, I did like Arrow of God very much. I think Obi has accepted the bribe because of the issues he had in his own life. For example, If he still had his girlfriend or his mother, he wouldn't be taking bribes. My point is that the story is not really about being honest when other people are not. It is much more complex than that. The questions that come to my mind are how can one be expected to stay honest when one is faced with so much problems? Also, don't you think that Obi start taking bribes as self-sabotage because he was so depressed? One thing i love about Achebe's book is that at the end of the novel you are still asking yourself questions. Just brilliant! You are so right, it is quite a complex story. But one thing I loved about it is that it makes you think. It made me think a lot and I was asking myself so many questions - especially the question of honesty in the face of so may obstacles.